When you feel that your airconditioning is no longer efficiently cooling down your car, then it's time to get an aircon service. When the aircon stops working, it's most often than not due to the refrigerant needing to be topped up, rather than an actual repair. Topping up your refrigerant is much cheaper than a repair, and is commonly known as a regassing, recharging or refilling. All airconditioners lose refrigerant, which means that the cooling capacity is reduced over time. On average the airconditioning system loses around 10% in refrigerant per year, so ideally there should be no more than two years between servicing your aircon system. Checking the refrigerant is not always included in a standard or full car service, so it will most probably be up to you to make sure it’s checked or booked into a seperate air conditioning service. When you ask for a servicing on your car's airconditioning, the garage will recharge or refill the refrigerant. The garage will completely remove all traces of the old refrigerant from the system and pipes, and refill the system with fresh refrigerant. The whole process takes around 45 minutes, so it can be done while you nip to the shops or even while you wait. The changing and refilling is carried out with specialist tools, that use high pressure and low pressure ports to ensure the full system is flushed clean before new refrigerant is added. Due to the toxicity of refrigerant, it is highly recommended that you use a quality garage to ensure that the refrigerant is disposed of properly. The refrigerant fluid is priced per gram and can be quite expensive due to the environmental taxes. So remember to always check whether refrigerant is included when you search for an aircon offer, or whether it is an additional cost. This can hugely influence which is the cheapest quote. As part of the air con service, the mechanic will also top up the lubricant around the compressor. Due to the temperature changes within the aircon system, it is important to keep the parts well lubricated, so that it does not dry out or deteriorate between services. It is also normal for the air filter to be changed occasionally, and for the dryer to be checked, which extracts moisture and dirt from the circulating refrigerant. When you have air conditioning in your car, there are some signs that indicate you should have the system checked by a mechanic and some that point to self-maintainence. The function of the air-conditioning system ensures that the air inside the car is cool through the summer months. However, when the car is turned off, the pipes get cold, and when the summer's hot air warms them up it creates condensation inside the pipes. This creates moisture that flows through the system and is often why you see water drip out of the exhaust pipe. The water from the condensation usually drains away, however there is often some pockets left which do not disappear by itself. It's in these areas of accumulated water that bacteria and microorganisms can grow. These can cause respiratory problems and eye irritation, or just create a musty and unpleasant smell. By turning the heat to full power occasionally, it will help reduce pockets of condensation, but it is not enough to remove the bacteria. If you experience any moisture and/or odour, try to use an air conditioning cleaner. Standard products usually instruct you to turn up the heat in the car, open the can of cleaning fluid, leave the can in the vehicle, and keep all doors closed, usually for about 15 minutes. The car should then be vented, and the air in your car should be fresh again. Always read the product directions, as time and procedure may vary from product to product. If that's not enough, it must be serviced by a garage that handles air conditioning. Due to the 10% loss in refrigerant per year, it's recommended to have a service at least every 2 years. However, if you drive a lot, you should have the airconditioning checked every spring, before the warm weather starts. If you leave too long in etween aircon servicing, you risk costly repairs to the aircon system. By waiting too long between services, you risk the compressor running out of lubricant causing a burn out due to the heat. Repairing this can cost well over £350. Here at Autobutler you can compare 3 aircon quotes, to find the cheapest and most convenient deal! Saving fuel is always a hot topic of discussion when it comes to motoring. And of course, it's common sense that it will cost extra to have the airconditioning running continuously even during cooler months. But keeping the air conditioning off all winter is not a good idea, stationary lubricant can cause the gasket to dry out and leak, which can lead to costly repairs. Running it periodically in the winter months will keep it moving and ensures that your car doesn't leak any air conditioning fluid. You can also save money on your fuel consumption by servicing your aircon every year. 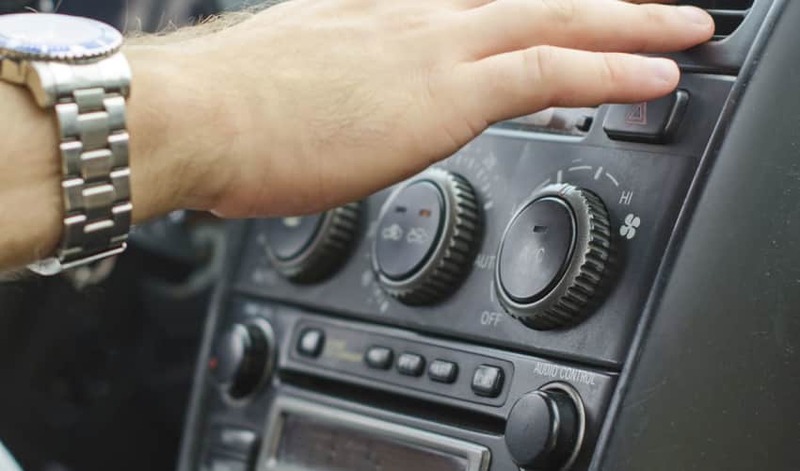 Lower refrigerant levels makes it harder for the aircon system to cool down the air in your car, so by topping up every year, you make sure your system works to it's very best! When the windows mist up, it may be a sign that the air conditioner should be serviced. Keep an eye out for it on the windscreen above the blowers, shortly after starting your vehicle. If there is a musty and/or damp smell when the air conditioning is running, it is also an indication that something is wrong. If the unit does not cool, even if it's put on cold, there is obvious something is wrong. * Is Your Air Conditioning in Great Shape?